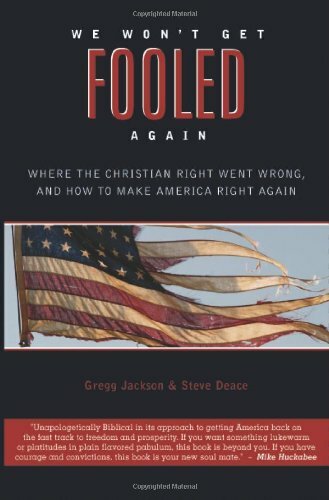 The book states that “Christians’ lack of political and cultural success is of enormous significance, yet most evangelical and pro-family voters who support Christian Right organizations with their votes, lobbying, and funds seem oblivious to the gravity of the losses and the depth of cultural demise…. This book will awaken many of the rank and file to the real record of their leaders, although it is not just about these failed leaders and their organizations, but also about the future of our families, our churches, and yes, our country too.” The authors correctly access facts about some of the Christian Right allies, the Republican Party, President George Bush, Pat Robertson, Ralph Reed, John Piper, John MacArthur, Mitt Romney and others and the failures of “Christians” working in the political system to point out their shortcomings and hold them accountable. The book is an eye-opener as to factual matters mentioned above for “Christians” who have had their eyes closed. For others, it is a waste of time, not only as to factual revelations but also and especially in one’s search for the answers to the questions posited. Reading the book is akin to reading the analysis of the reason for Job’s losses and sufferings (ultimately, for the answer to the question of “Why are the righteous afflicted?”) given by his “friends” Eliphaz, Bildad, and Zophar. The platitudes of the authors of the book are true enough, but then every “Christian” who has been involved in the cultural wars for any length of time knows them, and they shed no light on the problems addressed. Only when God answered Job out of the whirlwind was the answer to the question revealed. Likewise, only when American “Christians” listen to the Word of God and apply the God’s knowledge, understanding, and wisdom contained therein will they truly know how to fight the spiritual battles they have been called to fight as children of God. To gain that knowledge, wisdom, and understanding, they must be willing to do a lot of Holy Spirit led meditation on the relevant biblical principles. Of course, the principles of God’s Word must be applied in real life to be effective. Therefore, in order to apply those precepts involving civil government, one must understand the historical, spiritual, and legal atmosphere in which he is operating. This book does nothing to lead one to any understanding of these matters. The book gives no biblical understanding of the principles concerning (1) God-ordained governments (individual, family, civil and church), and the (2) the God-ordained relationship between church and state, nor is it insightful concerning (1) relevant American history, (2) relevant American law, and (3) the American application of the relevant biblical principles. The “authorities interviewed in the book for the most part, including David Barton, have no understanding of these matters. The smooth-talking, charismatic Barton, in particular, has indoctrinated and misled millions of American “Christians” (including the author of this review until he spent several years in intense study) with selected facts taken out of the context of the entirety of the facts. He has revised history and, in effect, pushed anti-biblical goals and methods. In conclusion, the book is a waste of time for anyone who really wants to make a difference. Following the advice and teachings offered therein will only contribute to continued disaster. Instead of misusing one’s time on such a sham, the concerned believer should go to another source for help, a source whose standard is the Word of God. One such source is the “Separation of Church and State Law” blog (opbcbibletrust.wordpress.com). The author of the blog has done the vast biblical, legal, and historical studies that will equip a believer for spiritual warfare. There one can have free access to all the materials he needs to put on the spiritual armor he needs to successfully glorify God. Even the the books are available free in online and PDF form (of course, if one prefers and can afford the hard copies, such are available). As the student studies the materials, his standard should be the Word of God (in English, the KJV).